Over 50 common and exotic scales and modes for guitar. Scales are the foundation of music and can be found in every known culture. With all styles of modern music, scales are the heartbeat, breath and soul of the guitar solo, the guitar riff and even the vocal melody. This video course includes every guitar scale you've ever wanted to learn--presented in a simple root-to -octave format, starting with basic scales, such as major, minor, pentatonic and blues, and then progressing into patterns that span all musical styles and cultures, even including exotic scales such as the Balinese, Hirojoshi and Kumoi. 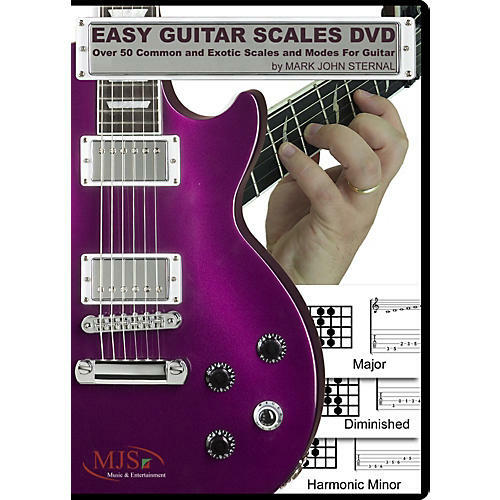 There are over 50 scales for you to use right away to spice up your guitar playing, each with an on-screen demonstration at both a slow and fast tempo. The bottom half of the screen provides you with the option of reading sheet music in the form of note charts, traditional notation, or tablature (TAB). As a bonus, you also get important tips on changing musical keys, jumping octaves and extending each scale to a higher and lower pitch, which will ultimately help you navigate your fretboard with precision and accuracy.